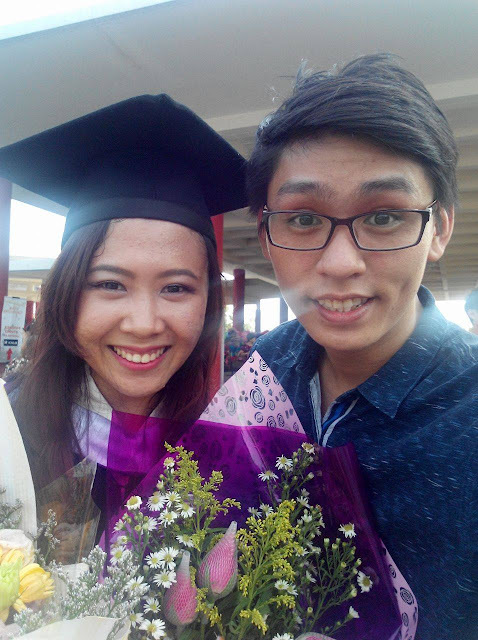 I know, it's been a year and I'm just sharing about my convocation and new life after graduated now! In case you haven't know, I was studying a degree course named Applied Mathematics with Computing in UTAR. It surely sounds rare and weird to you cause it's really an uncommon course to take. Let's start with why do I chose this course in the first place. Just like a lot of you, after graduated from high school, you like accounts a lot, and because it's your favourite subject, you pick Accounting as your diploma/degree course; you love chemistry so much which makes you (your innocent mind) wanna be a chemist in the future, and so on. FYI, I study maths doesn't mean I know account or finance. It's more to calculus, algebra and maybe statistics. Yes, it's hard to find jobs like this yo. I still can remember that there are several times that I was so struggled that I wanted to withdraw from studying in UTAR, and start my own business. But then, I don't have any experience at all, which might lead to a worse ending. Thinking back, luckily I didn't withdraw. But thinking back further, why didn't I just get a PR or Marketing course and just freaking graduate with an easier-finding-job?! Studying was never something for me, my schoolmates knows that. I'm always a person who study for the sake of study, and also being able to fit into the society because I don't have any aims & directions after graduated from high school. But it is something big for my family members! They were so proud of me for being able to graduate because they know that university life is never easy, and I made it! Choosing the wrong course WAS a disaster for me, but I've came through it. Now, this part of my life is over. My life being a student is OFFICIALLY OVER. I'm graduated, although not with a flying colours result, but I DID IT! No matter how many obstacles I've been through, they are now behind me and the new life is ahead of me! I'm ready to take up any new challenges. So here are some images taken during my Convocation on 26 March 2016 @ UTAR, Kampar. Ohana. Missing my beloved sister & uncle here. The BFF since secondary school. The 2 pieces of onions from my onion gang. Oh that's me before I wore my rob. Thanks for dropping by and the bear, Yin Xuan! The foundation gang that made my uni life so interesting! This guy say I didn't include him in this post so... hello Jensen! Thanks for dropping by before your movie, and also the 100 plus! Gosh I looked awful here, feel like sweating also by just seeing myself here hahaha! The AM gang! 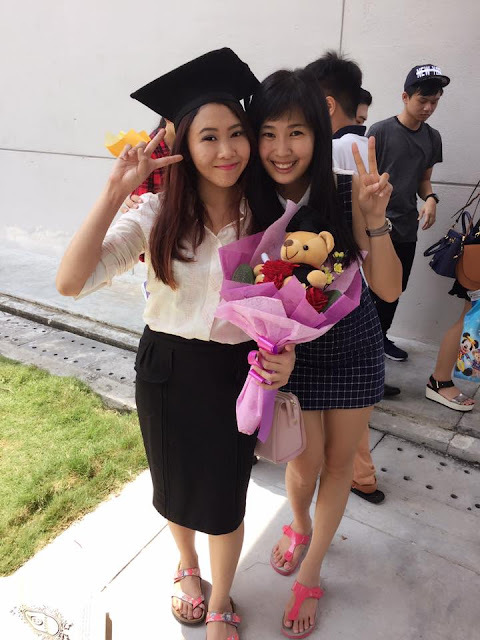 Both of you fast fast graduate also! Last but not least, the boyfriend + the man behind all these images. Now it's the part where everyone are curious about - what are you working as now? I just don't know why, I always picked the thing that people won't understand. First my course, then my job position. Anyone of you heard of the job Implementer before? If you did, here's a clap for you. Not being sarcastic tho. Basically, it's about buying, billing, organizing, calculating and paper works in a media company, it's quite something that I pretty love to do. That's all you need to know. To be honest, my current full time 9-6 job has just started 3 months ago, which means I was unemployed for 10 months. Not totally unemployed, but I was working as a part time admin nearby my house in Penang. So for those who just graduated, don't worry, it's not necessary to get a job immediately until you think you're okay with that job, unless you're super in need of money, no rush, no rush. I wanted to work in Penang because I want to go back to my family, it's kinda tired of living out here alone. But the opportunities seems to be lesser in Penang, went to interviewed for a few jobs and they are either underpaid or doing something that's not suitable for my personality. Well, first job has to be fine for you they said. Must work one year in your first job they said. Turns out working as a part time admin near my house was so perfect for me that I gave up on seeking for full time jobs after 6 months. I love my life that time as I'm able to sleep till late, go to work at a flexible hour, play my little pony game during free time and take leave anytime I want! But all of a sudden, I was contacted by one of the boss of my company and asked to have a job interview (as a media planner) immediately, and best if I can start to work immediately. I was curious, so I went down to KL for this interview and see if I'm capable for this job or not. Turns out I was so interested in it, and I've never thought of seeking of this job position before either! However, I was not hired at first. But after 2 weeks, I was contacted again saying that they've opened a new position (Media Implementer) again and they want me in. So that time, I decided to say yes and move on with my life. I really have to step out of my comfort zone and learn something new before it's too late. And most importantly, I have to start earning money for myself now! After 3 months of working here, I'm finally settled down and sitting in front of my laptop to blog about this. I'm finally earning my own money and paying for my own bills and food. And surprisingly, a good working life (for now)! I'm so happy to join this company as it provides a lot of things like breakfasts, good facilities, good colleagues and most importantly, freedom. I felt that everything happened this year was a bless, not just on my working life but where I'm staying at the moment is better than what I expected, despite that the rental is crazy.